Fran's House of Ayurveda: What is VATA? The three Doshas - vata, pitta and kapha - are based on the 5 elements: air, space/ether, fire, water and earth. Vata is the culmination of air and space. The nature of air is movement, changeability, and it is cold and dry; the wind is Vata. Vata manifests in our bodies in several ways: as space, it is present in the hollow structures within the body, like the colon, bladder, uterus, lungs, and spaces between our joints. As movement is causes functions of motion and transmission, like nerve impulses. If your constitution is predominantly Vata, it means air/space dominates how your mind and body function. 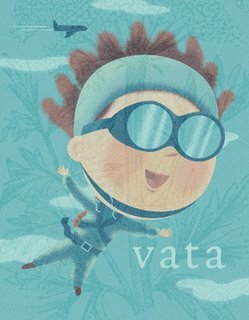 Characteristically, Vatas tend to be thin with fine hair, restless or anxious, and have quick minds. Vatas might prefer to graze than sit down to a big meal. Vata promotes irregularity, so Vatas might have uneven physical features, have irregular bowel movements, and be unpredictable. Vata is characterized by dryness, so Vatas tend to have dry, rough skin. Because Vatas are a little high-strung, the best activities for you are calm, slow, soothing ones. Meditation can ground you, getting plenty of rest is important, and gentle activities like yoga, walking and swimming are great. Keeping a daily routine also helps the Vata mind find some structure. Conversely, the lightness of Vata gives you an afinity for creative and spiritual thought. You can be "out there" on your perception of life compared to the more grounded Pittas and Kaphas, but this ability to see and feel so acutely is a wonderful gift. I'm a Vata, according to the questions. I am a little confused about appropriate foods for me. Some sites say eat this, other sites say do not eat this. A lot of the foods I like a not included in any of the recipes. Also, I starved for my first six months, being allergic to milk. A dr finally suggseted my mom put me on soy, which she did, and I thrived. However, some of the recipes are saying NO SOY. Confused. As a Vata, what foods can clear my mind, and help my dry skin and hair grow better?